To kick off my gift guide series I thought I would start with something easy, gifts under $50.00! These are those gifts that can literally go to anybody. Maybe it's a last minute gift or it's for the holiday party at your job- these are some go-to gift ideas that can't go wrong. I plan on posting a ton more of gift guides that are specific to particualr people, but if you have any other ideas just leave a comment below! One. Pajamas // I love a good set of pjs. They are also so comfortable and cute. I seriously rock onesies during the holidays, they're my faovrite. Places like Nordstrom, Victoria Secret's, and JcPenny always has hella cute and afforadble pajama sets. Two. Beauty Sets // This may sound like a girlish gift, which for the most part it is. However, there are some nice gift sets out there for boys too that come with cologne, face masks, and shaving essentials. If all else fails, you could always put one together yourself! Hit up Marshalls or Target and throw a ton of great products together in a decorative basket. Three. Gym Essentials // Even if people don't go to the gym they get active one way or another. Give them some comfy workout clothes or wireless headphones for their daily routine. Active shoes are also a great gift to give (as long as you know their size). Sneakers for the gym and slides for afterwards. Possibly even an inspiring book to get them jump started on their New Years resolutions to keep a workout routine! Four. Books, Games, and Movies // Everyone enjoys a good book, movie, or game. It all depends on the person you're shopping for but if you know that they have a favorite celebrity you could get them their autobiography. If they have a favorite show or movie you could get them the entire collection. Board and card games are always a blast as well no matter how old you are. Five. Winter Neccessities // As long as you live in a cooler area, actually even if you dont, everyone loves warm winter neccessities. Sweaters, coats, gloves, scarves, and hats! They sell really cute and afforadble ones at Forever 21, Target, and TJ Maxx. 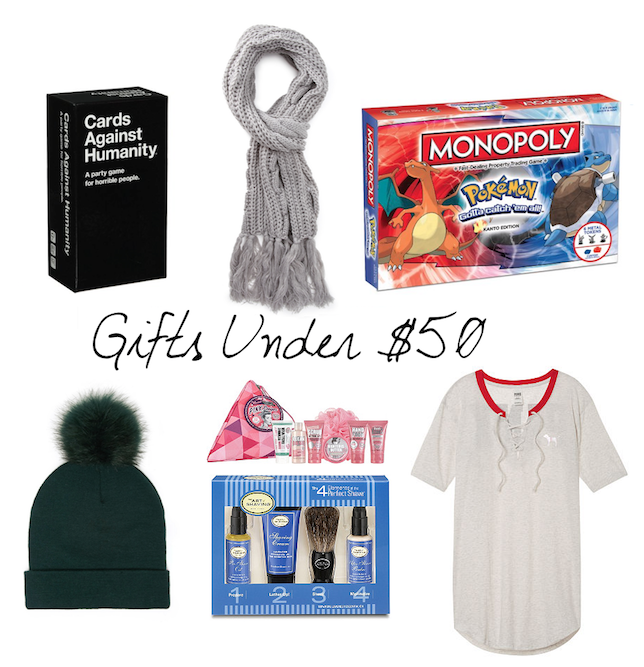 Do you have any other gift ideas under $50? Let me know by commenting below!